I almost didn't think I'd make it - but I've just wrapped up this little card today, and even managed to photograph it with the dark clouds rolling in. I really wanted to play along with this month's Pinkfresh Studio challenge - which was all about puffy stickers! I don't have a heap of puffies in my stash, but I found a way to use what I got. Love when that happens! Here's my take on the challenge - and be sure to check out all the amazing entries over on the Pinkfresh blog! I used the gorgeous Pinkfesh Fleur 1 stamp set for all the beautiful florals at the top of the card. I loooove this set so much and I want one of my own! I was lucky enough to play with a set to test it out but I'm going to pick up one of these soon. I love it so, so much! I used some really pretty watercolors to add a bit of colorwash to the embossed florals. 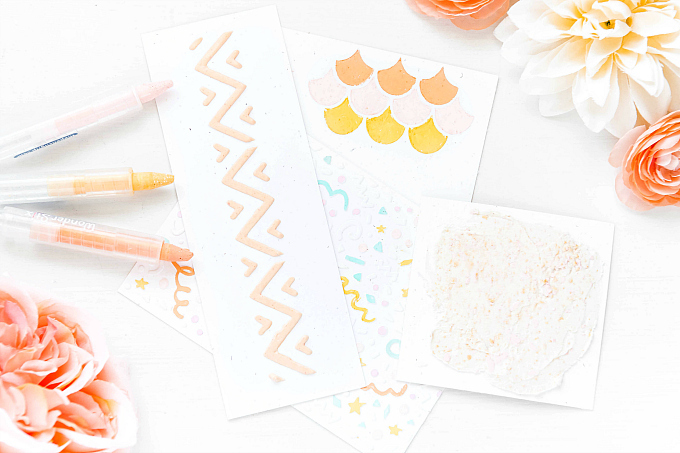 These soft colors are a combination of Distress Inks and Papertrey Inks. I used shades of Aqua Mist, Amethyst Allure and Picked Raspberry. Love these tones together! I really wanted to florals to shine, and to make sure I incorporated enough puffi-ness, so I kept the rest of the card color free. Then I added a dimensional heart, which I cut using Papertrey Ink's Limitless Layers: Stitched Hearts, backed with my favorite super-duper sticky adhesive sheets. These are so great for adding to cardstock before you run it through a die-cutting machine with your favorite die. Because it's super tacky you can stick almost anything to it! I love adding glitter, beads, or other fun mediums to make any die-cut shape a fun, new embellie. Here, I added my favorite Prills beads - Lavender and Lace. They are sooo delicate and pretty and I love how the different sizes work so well to fully cover any shape. And they come in piles of pretty colors - I must get a few more to try. After adding the heart, I used these really pretty iridescent puffy letters that came as a part of a decorating kit I bought a while back. I thought I would never really use them, but kept them anyways, and they worked perfectly! The colors turn from aqua to purple to pink with each little catch of light, and it accentuates the colors of the card so well! Here's to never throwing anything out, amiright? 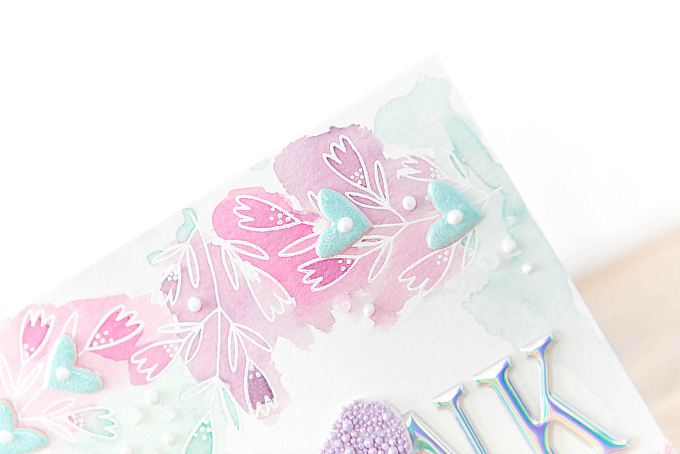 And last but not least, I added a few more puffy heart stickers at the top, which used be a lovely shade of blush, so I added a light dusting of embossing powder using Tonic Studios Nuvo - Serenity Blue to give them a makeover. I also added a stamped and embossed sentiment onto some heat-resistant acetate that I've been loving sooo much. It's perfect for embossing without any warping. Just a few Nuvo Crystal Drops in White, and a wee ricrac trim at the bottom and this card is all done! Oh and I added a couple more of my favorite rhinestones - Queen and Co Posies - at the bottom too. Oh my, so much goodness!! I would have to send you a thank you card for receiving this one! It is so very pretty! I just love all the "puffy" details. Love your work all the time! Aw, thank you so much, Samra! Many hugs to you!! Stunning like always my dear Ivana! I love puffyness of this one! So many thanks, dear friend!! Sending you big hugs!! What a lovely card! Anybody who will get this would definitely love it! Thank you so much, Sam!! So kind of you! Oh wow--so feminine & beautiful--can't take my eyes off it, Ivana! Incredibly creative use of the letters & hearts! I almost got some Prills & now I know what adhesive sheets to get next time!